Late last season we reported on the ridiculous 67-0 and 79-0 wins in the lower leagues of Nigerian football. Corruption spreads to all levels of Nigerian football and this league table comes from the top tier of Nigeria. Kano Pillars FC were crowned Champions earlier this week but only one team managed more than 2 away wins all season, and they were relegated. No team scored more than 12 goals in their 19 away games. Fixed. According to Nigerian reports this is due to corruption, intimidation and dirty tricks to mess with the away team. 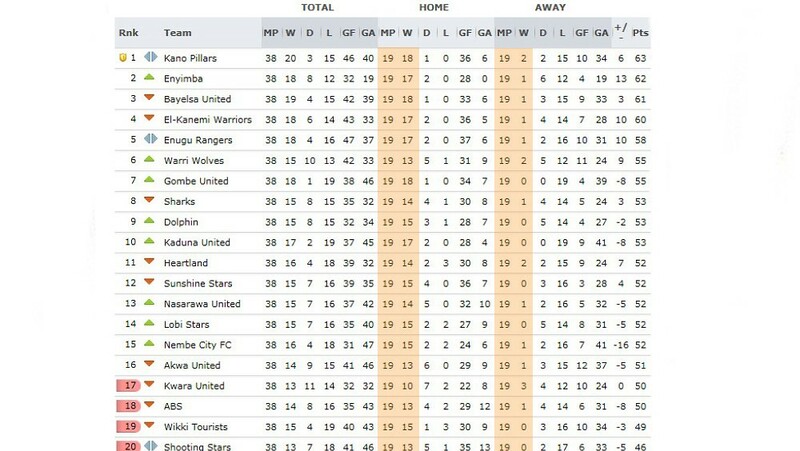 Just look at the picture of the final league table with each sides home and away form. Victor Ochofiye Adakole: You can say whatever you like, but there’s nothing here. Simply put, it is very difficult to win away games. Most clubs win their home games or draw hence the closeness in points. Nobody is complaining and it is fun to follow. If you think you know better, keep your thoughts to yourself and think of the corruption in your hearts first. Repping Naija till I quench!